Onondaga Lake is undergoing a remarkable recovery! Water quality has greatly improving and the fish communities are thriving. The Ambient Monitoring Program (AMP) is Onondaga County’s comprehensive program to evaluate the quality of the waterways and track changes brought about by the improvements to the wastewater collection and treatment infrastructure and reductions in watershed sources of nutrients. As part of the AMP, Onondaga County has been monitoring the fish community of Onondaga Lake since 2000. Changes in the fish community have occurred as water quality and habitat conditions have improved. The significant reductions in ammonia and phosphorus input, resulting from improved treatment at the Metropolitan Syracuse Wastewater Treatment Plant (Metro), have resulted in increased dissolved oxygen and water clarity levels and a decline in algal abundance. Clear water improves light penetration, allowing expansion of aquatic plants and improving fish habitat. 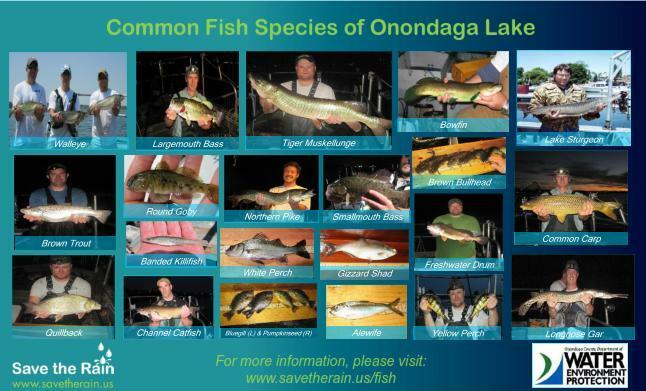 Since 2000, more than 149,000 individual fish have been captured from Onondaga Lake by Onondaga County’s sampling efforts, representing fifty-three species.